Traditional tap design that never dates, the Regent chrome mono basin tap captures the aura of a bygone time. 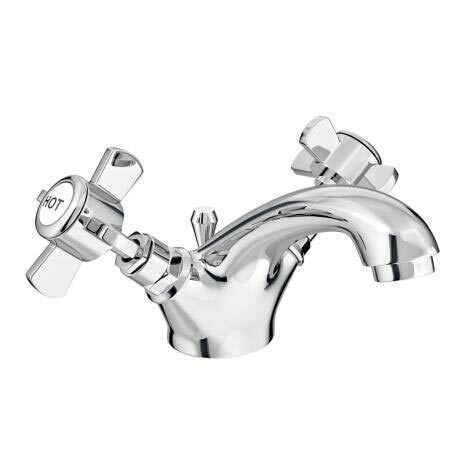 Manufactured from quality brass with a chrome plated finish. Supplied with a pop up waste. The perfect mix of traditional design with contemporary build, meaning that it not only adds at touch of class to your bathroom but will also last the test of time with a 10 year guarantee. The ideal complement to any basin, it gives you everything you could want and more from a tap. Hi, yes, the button at the back is used for the pop up waste. Also, this mono basin mixer does come with connecting rods. Hope this helps, please let me know if you have any further questions. Got these taps to go with York grey vanity unit they look great on sink also tap matches those on my towel radiator also purchased from Victorian Plumbing. Good quality product and good price. Highly recommend this company. Fantastic item for the price. Looks amazing. Quick delivery for free too! Delivery was very prompt and the taps were well packaged and protected in a bag within the outer box. They are of a very good quality and were easy to fit. I was looking for something understated and traditional and this tap is just the job. Well made, well packaged and at a decent price.